Heavyweight contender Jarrell "Big Baby" Miller failed a drug test ahead of his scheduled title bout with Anthony Joshua on June 1 at Madison Square Garden. Miller "tested positive for the banned substance GW1516," according to ESPN's Dan Rafael, who added that the test was "a random Voluntary Anti-Doping Association-conducted urine test Miller submitted to on March 20." 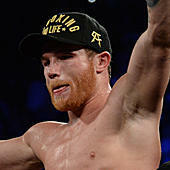 On Wednesday, the New York State Athletic Commission denied Miller's application for a fight license, stating that Miller committed a violation relating to use of a prohibited substance, the organization said in a statement. Miller (23-0-1, 20 KOs), 30, had ironically spent portions of the press tour leading up to his fight with Joshua (22-0, 21 KOs), claiming that the British champion -- who holds the WBA, WBO and IBF heavyweight titles -- was himself using performance-enhancing drugs. Joshua eventually responded, calling Miller's comments a "compliment to all my dedication and strength and power training." This is not the first time that Miller has failed a drug test, though it is the first time in his boxing career. Back in 2014, when Miller was kickboxing with GLORY, he tested positive and was suspended for nine months. The substance that he tested positive for this time, GW1516, is so dangerous that WADA in 2013 took the rare step of issuing an alert about the substance in order to try and protect athletes who may be using it. With Miller likely facing a one-year suspension, his fight with Joshua is now officially in doubt. With a date and venue already set for what would be Joshua's U.S. debut, it's likely a replacement fighter will be found. Who that may be, however, remains to be seen. Joshua last fought in 2018 when he stopped Alexander Povetkin by TKO in September to retain his titles.